Republican People’s Party (CHP) deputy Şafak Pavey, the first woman with disabilities to be elected to the Turkish Parliament, received the International Women of Courage Award on March 8 at a ceremony in Washington. “Şafak Pavey has tireless passion and she has brought that energy to work on behalf of the U.N. Convention on the Rights of Persons with Disabilities. Her advocacy around the world is helping to protect so many people. When she was elected last June, she became the first woman with a disability to sit in the Turkish Parliament. But she has transformed her disability into a strength. Wherever she travels, and she’s traveled quite a lot, she is bringing attention to the issues that affect persons with disabilities, vulnerable populations, women, children, and minorities,” Secretary of State Hillary Clinton said. “We really honor you because you are going beyond the expectations that were set for you in your life, and by doing so you, are breaking down barriers not only for your fellow Turkish citizens but for women and men everywhere,” Clinton said. Other special guests of this year’s award ceremony included Leymah Gbowee and Tawakkol Karman, 2011 Nobel Peace Prize Laureates. The prestigious Secretary of State’s Award for International Women of Courage annually recognizes women around the globe who have shown exceptional courage and leadership in advocating for women’s rights and empowerment, often at great personal risk. 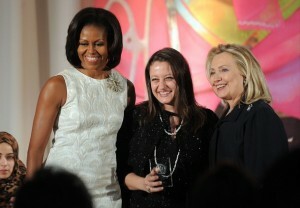 Since the inception of the award in 2007, the Department of State has honored 46 women from 34 countries.